About once every couple of years, a Financial Samurai post goes a little nuts on the internet. Recently, Twitter got a hold of “Scraping By On $500,000 A Year: Why High Income Earners Can’t Escape The Rat Race” and consumed it like a rabid dog shaking a rag doll. I first started noticing Twitter activity Friday morning, March 24. Overnight, it seemed, about 500 new tweets of the post had appeared. By Monday, March 27, the tweet count had risen to a whopping 40,000+! What the heck was going on?! Apparently, the internet found the $500,000 a year couple’s budget so absurd it started poking fun at the post. Some say my chart has even reached meme status. Well pinch my nuts! I get to check off another bucket list item before I croak. The budget I originally posted is actually a real life couple’s budget shared with me to share with you. Their budget has been corroborated by hundreds of other couples and individuals making similar incomes while living in an expensive city like NYC, SF, London, Paris, LA, and Hong Kong. Financial Samurai already gets over 1 million organic pageviews a month, so it’s easy to gather feedback. Just check the comments on the post to see for yourself. 1) It’s not what you make, it’s what you keep. Without discipline, it’s easy to spend everything you earn. Lifestyle inflation is the biggest culprit for why folks never feel like they have enough. It’s not just the cars and houses that people compete on, it’s also the schools parents want their children to attend. Hopefully, the post encourages everyone to take a hard look at their own finances or if they haven’t already done so, create and monitor their own budget. “If you can’t manage it, you can’t improve it.” – Peter Drucker. 2) High income comes with high costs. Yes, it’d be nice to earn big bucks living in the heartland of America, where I’m bullish, but in the heartland, those high income jobs are harder to come by. If one shouldn’t spend any more than 3X – 5X their gross income on a home, how much does one have to make in order to afford the $1.2M median home price in SF or NYC? Answer: $240,000 – $400,000 AFTER coming up with a $240,000 downpayment. Unfortunately federal income taxes adjust based on income amounts and not on the costs for living. 3) Think about geo-arbitrage. Technology and the internet are allowing people to untether themselves from an office. Find companies that allow you to work remotely in a lower cost area. You might not get to relocate to Bali, Indonesia, but there are plenty of fantastic cities that are much cheaper than NYC, SF, LA, Boston, and Washington DC. I’ve interviewed several CEOs in SF and they all say that given SF’s tight labor market and high cost of living, they are hiring more remote workers. Better yet, have your own internet-based business. Take advantage of the best technological shift in history. 4) Save and invest often over the long run. There’s great value in maxing out your 401k and building home equity over time, even if you have very little left over. According to the Bureau of Labor Statistics, only about 55% of the American workforce has access to a 401(k) and only about 38% of the total workforce participate. Doing some low level math, that means roughly 31% of those who have access to a 401(k) are not participating. I strongly believe that over time, home equity is one of the major reasons for a widening wealth gap between home owners and renters. Find a place you know you’ll be for the next 10 years and try and get neutral real estate by owning your own place. Of course, be responsible with your purchase. 5) Ask what it’s all for at the end of the day. I know plenty of high earning people who are not happy because they are stressed at work and can never spend as much time with the people they love. Not only that, they know the work they’re doing isn’t really helping society so they feel they’re selling their souls. They can’t leave due to an unhealthy desire for prestige, money, and power. Realize there’s a wonderful life beyond just making lots of money. Seek your happiness before you look back on life full of regret. I realize it’s only human to judge others, even if we’ve never walked in their shoes. However, simply judging others does nothing to improve our own situations. Therefore, let’s do our best to approach things with open minds. With open minds, progress can be made. Financial Samurai has always been about finding solutions to problems. I’d like to provide an optimized budget for this $500,000 couple. I’ll conclude by highlighting some interesting observations I’ve made about the public’s reaction to my original post as well. Let’s go through the major line-items one by one! Income Taxes ($11,845 savings): I’ve brought the couples effective total tax rate down to 38% from 40%, saving them $9,280 a year. Their total tax bill of $173,755 includes federal income tax, state income tax, city income tax, FICA tax, and sales tax. It’s very hard to bring your tax liability down as a W2 wage earner. They’ve decided to contribute the maximum $6,750 per couple in a Health Savings Account (HSA) to pay for current health care expenses and save for those in the future with pre-tax dollars. Having a business is consistently one of the key differentiators between the rich and the rest of us. If you’ve got a business, you can deduct many of your overlapping life expenses as a business expense e.g. business trip to Honolulu for a semi-annual offsite. You can also contribute more to your pre-tax retirement savings (up to $54,000 for 2017). Property Taxes ($10,595 savings): The property tax rate in Park Slope, Brooklyn (King’s County) is surprisingly only 0.627% compared to the New York State average of 1.5%, and the national average of 1.2% (that’s what it is here in California). Therefore, on an assessed value of $1,500,000, the couple really only pays $9,405 in property taxes versus the $20,000 originally estimated. However, because there are all sorts of weird property tax assessments in NYC, I’m still inclined to believe the figure is higher. If anybody else owns in Brooklyn, please share your wisdom. 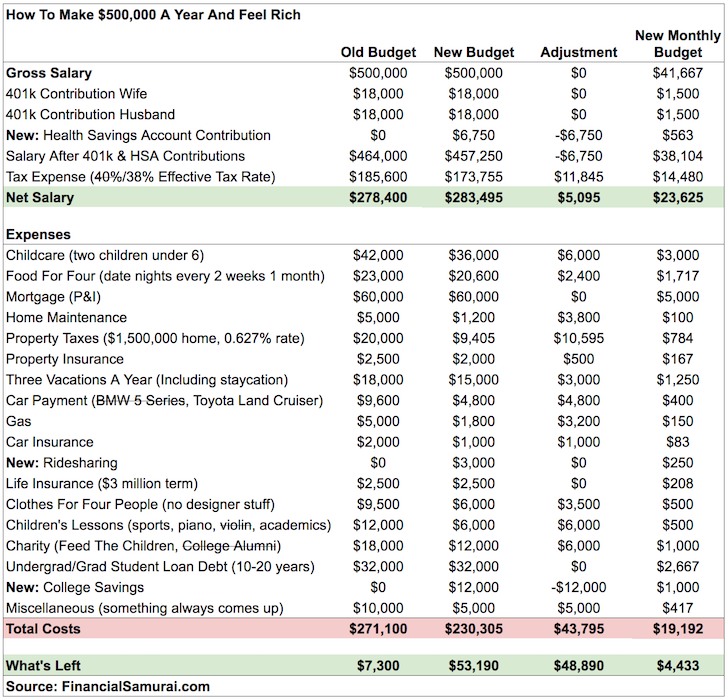 Childcare ($6,000 savings): If you haven’t figured out by now, children are expensive! Every parent wants the best for their kids, which is why demand is relatively inelastic and child-related expenses remain high. Given all the backlash from the internet, however, the couple is able to find a better deal, albeit a little farther away. They’re now only spending $1,500/month per kid compared to $1,750/month per kid. As their kids enter kindergarten and spend more time on lessons, childcare costs will gradually decline. Food For Four ($2,400 savings): Unfortunately, date night every two weeks has got to go! 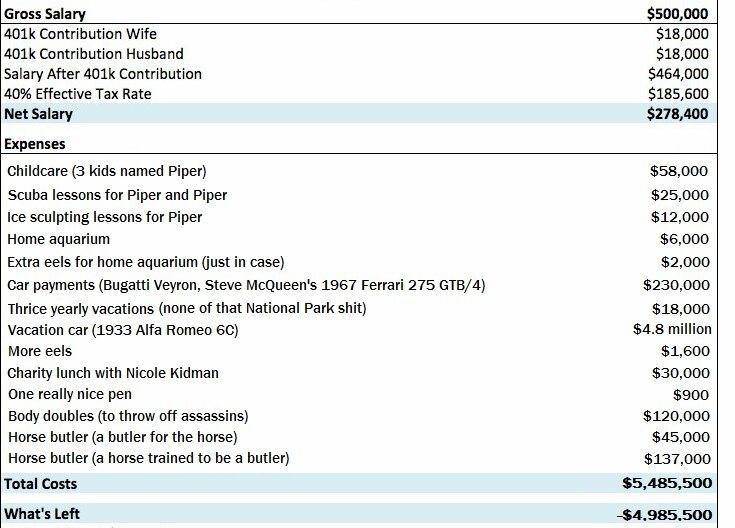 Each date on average was costing the couple over $200 when you add up transportation, food, wine, tip, taxes, and a Broadway show. Try landing a ticket for Hamilton for under $100. Good luck, sucker! Therefore, the couple is seeing fewer shows, more movies, and now saving $2,400 a year. Not only is this couple saving money, they’re also eating healthier for a double win. Still Three Vacations A Year ($3,000 savings): By deciding to vacation in NYC for one of their three vacations, the couple saves $3,000 on airfare, hotels, and activities. NYC is the greatest city in the world for six months of the year. There are so many free and fun activities all around. There’s a reason 48.8 million people annually visit NYC! Yes, $15,000 still seems like a lot of money, but it’s divided among four people across 21 days. Without living it up a little on vacation, this 60+ hour a week couple might burn out at work or blow up their marriage because they hate life so much. Children’s Lessons ($6,000 savings): Screw violin! I learned violin for three years and hated it. Even if I got any good, it’s not like I’d bust it out at a party and play. That’s what a guitar is for, which can be easily learned online for free. Athletics is part of Americana, so the kids are still receiving swimming and tennis lessons. Who knows, both of them might get athletic scholarships one day. At the very least, college admissions officers and employers look much more favorably on scholar athletes. Just having a 4.0 GPA and a near perfect SAT doesn’t cut it anymore, especially if you’re Asian. Charity ($6,000 savings): Sorry alma mater, your tuition and endowment are already massive enough. Harvard, Yale, Princeton, and Stanford all have endowments over $20 billion. MIT, U Penn, Michigan, Texas A&M, and Columbia all have endowments over $10 billion. It’s best they save their money for those who really need help. Giving $1,000 a month to Feed The Children means a lot to this couple. 300 million children go to bed hungry every day while 68% of America is obese. Something is wrong with this picture and they want to do their part in making a difference. Miscellaneous ($5,000 savings): Something always comes up, otherwise why doesn’t everybody have a perfect financial record? Because this couple is now more self-sufficient, they should be able to minimize any excess spending or surprises. Financial independence is all about generating enough passive income streams to cover your expenses indefinitely. If you can also build, cook, clean, fix, and maintain, you’re golden. Not too long ago we had to start our own fires and hunt for our own food. A self-sufficient woman is a rich woman. Total Cash Flow + Net Worth Addition: $117,190 after contributing $36,000 to their 401ks and paying down $25,000 in mortgage principal. $117,190 equals a respectable 23% gross savings rate or an impressive 36% after tax savings rate once we adjust for paying taxes on the $36,000 401k contribution amount. This couple should be able to build their net worth by at least $1.2 million every 10 years, assuming their incomes don’t continue to rise and their expenses stay the same. The problem with this new scenario is that despite optimizing their budget by $48,875 a year, they still have a $230,305 annual after-tax nut to cover! Given they have no other significant passive income streams, they need to likely work for at least another 18 years until after their kids graduate from college to even consider doing something other than 60+ hour workweeks in the law office.But given 80%+ of people wash out of big law by year eight, expecting to last for 18 years isn’t very good planning. The point of aggressively saving and developing a side-hustle when you’re young is so that you one day have the OPTION to do something else with your time when you start hating your life. Believe me, that day will come because everybody will hate their job at one point. Unfortunately, too many people start aggressively saving and side-hustling AFTER they start hating their jobs. Misery ensues for years. There is NO rewind button in life, which means we all have to try and anticipate the future today. 1) Shoot first, ask questions later. A study by the Media Insight Project, an initiative of the AP-NORC Center for Public Affairs Research and the American Press Institute highlighted that 60% of readers just read headlines, and not the actual article. As a result, the use of “Scraping By” instigated many people to condemn this couple’s budget (and me by extension) because they hadn’t read the substance behind the post. The featured image in my post with the caption, “Help! I’m drowning from all my money!” provided a clue to the astute reader that I was also poking fun at the subject. 2) People see what they want to see. With over 100,000 comments left on Financial Samurai since it started in 2009, I’ve observed this phenomenon many times. There is a perpetual echo chamber of people refusing to see the other side. It plays out in politics, stubborn arguments with friends and loved ones, generational wars, and in the work place all the time. The more we can try and understand another’s point of view, the more we can improve. Trying to see the other side is why I’ve given over 500 Uber rides, keep up with my Mandarin, coach high school tennis, constantly travel abroad, and invite people from different backgrounds to write guest posts. It’s easy to contract Dunning-Kruger disease and think anybody can do it if they just work hard enough. When you see the other side, you gain empathy and understanding. 3) Humor is incredibly effective. Understandably, a lot of people were mad at the budget because 99% of households earn less than $500,000 a year and must make tough choices to make ends meet. You can take a salty stance like Pulitzer Prize winner, Michael Hiltzik did with his column in the LA Times. You can focus on class warfare like wealthy Boston University alumni, Jeremy Binckes did in his Salon article. Or, you can take Kristen Lee from Jalopnik’s approach and focus on humor to get things across. Remember, the way you approach anything is a reflection of your own state of mind. You have a choice to look at the bright side or at the dark side. I’d certainly much rather grab a beer with an uplifting person like Kristen, than listen to Jeremy attack the woes of high income earners. When you come from a privileged family whose parents can afford $50,000 a year in tuition, it’s quite interesting to witness his negative viewpoint on wealth. Perhaps there’s an area of “rich guilt” I can delve deeper in a future post. For those of you experiencing rich guilt, please share with me your thoughts! Writing about personal finance is generally pretty boring. After all, how many ways can I tell you to stop spending like a donkey? But we know nobody is perfect. Some people actually make mega millions over their careers and still file for bankruptcy! We’re all trying to get a little better. Love or hate my article, I’m just happy that so many more people have decided to take a good look at their finances. Many have written in to say sheepishly they’ve finally created a budget of their own, but have not told anyone for fear of judgement. Who knows, maybe the next financial crisis won’t be so bad because millions more people are more prepared after reading these posts. Making a lot of money is great, but building wealth that can generate money for you so you don’t have to is even better. Sooner or later you will tire of the same old grind at work. When that time comes, you want to be armed with multiple income streams and a war chest of savings to carry you through to your next adventure. It’s been a little over five years since I had a day job. Even though I don’t make a lot of money now, I’ve got enough to be happy. It feels amazing to help other people with their financial problems. Find your enough and you’ll feel like the richest person in the world! Great post and echos what Ive said most of my life. People just don’t understand there is no automatic connection between higher income and more wealth. There is “potential”, but the result is not automatic. I’ve met surgeons that make $750k/yr but have little to no savings and (essentially live paycheck to paycheck) and then also met a self employed plumber who made $70k/yr who managed to save $2m. That’s why “getting a raise” at work isn’t automatically a good thing. If you spend $1 for every .75 you earn, a raise will make the spending problem worse. During his lifetime, Michael Jackson earned $2.1 billion, but still died with $500m in debt. How is this possible? No matter how much $$ you make, it’s ALWAYS possible to spend more than you make. For Michael Jackson, he made 2.1b, but spent 2.6b. It’s not automatic. More income does NOT automatically equal more wealth. I think you’re confused about how property taxes work in NY State. I live upstate and pay $5000/yr taxes on a house valued under $200000. That’s 2.5% (includes school taxes and county property taxes). Maybe the superrich & New Yorkers are getting some kind of sweetheart deal, but no way can you just decree it’s as low, effectively, as 0.6%!! NYC real estate taxes rates are a lot lower than Upstate NY. Mainly because of NYC income taxes. Godd! Ha this was awesome. I had read the original post before and then saw it pop up all over the internet and went, “wait isn’t this an older post?” I was sure someone stole it. Awesome post that when it becomes viral a lot of people’s real feelings came out. Interesting to read all the columns attacking it instead of taking a higher level view and looking at the other side or their own situation. I took the article as a great learning tool for myself to see where I am and where I want to be. Easy to get caught up in tearing people down instead of using their perspective to either learn or better yourself. Congrats on the meme status! I wanted to address kmpt1972 with regards to waiting to have kids due to expense and implied (actual) future financial losses. Having kids when one is younger is a value to many (myself included ) and is also lifestyle choice. There is a huge benefit to being a younger parent, compared to waiting to have kids until 35+. And that’s not to mention increased cost and risk of waiting to have kids. It is more difficult to get pregnant after 35, and not everyone remains with their partner and so the risk of opportunity loss increases. I think your point of having chldren too early for the Brookly couple was interesting, as it didn’t sound like they had them before around age 33 . You’re income is awesome. Kudos on your financial success. To add perspective, we had 2 kids in our young 20s, it was tight but we managed and then had 2 more in our 30s. Our older 2 are way more financially aware, and will probably remain so because they grew up with more budgeting… We have a paid for house, are 41 and 40 respectively, and have about $350k put away. Our combined income is about $250k, all kids go to private school. I know we can do more to have more, so I’ll be working on that. But we definately had way more patience, energy and overall vitality for our older kids, than for our younger set. Total is: 30235.90+15813.46+14694+7250+105908.75+2189.25 = 176091.36 which is a bit above the 173755 in the budget. Note that if we go with the Trump tax plan then Federal taxes will be 108374.98, an increase of 2466.23. This assumes the Trump tax plan keeps PEASE deductions reductions intact. 500K/year is not considered rich in Manhattan. They are lucky to live in Brooklyn. In my neighborhood a 2 bedroom appartment is 2mil and up. Yep. And to rent it is min6k/month. It’s a socialist city where taxes are outrageous. That said it is very likely that the value of their property will increase over time rather than stay flat as in many other locales of the midwest where you’re lucky to get you money back on a 1.5 mil property. NYC and particularly Manhattan is the most segregated city on hearth and as a result those who will not take a chance with the public schools (which are disastrous) end up paying 50k/child/year with post tax money: and that is enormous. Very small point. I’d actually cut the charity by $12,000 and not $6,000. But hear me out. Put the net new charitable contribution, $6,000 per year, into a Fidelity Charitable Donor Advised Fund. Take the tax deduction for 10 years without granting any principle or returns to any charity. Invest all contributions in a S&P 500 or Total Market Fund. Assuming a 7% annual average return the fund will grow to just shy of $95,000. And then this couple, only in their early 40s, can start bombastically donating larger sums of money to their charities of choice. You get the initial tax deduction same as what they’re doing now, but growth of principal tax free is the gain here. No, I don’t work at Fidelity. Yes, a small amount of fees will be taken out of your account annually….e.g., .6% for the administrative fee plus whatever fee your individual investments charge — e.g., .09% for the Fidelity Total Market Index Fund. I think they could do away with one of those cars, at least. It’s NYC. Completely unnecessary to be a two-car family. If you work long hours in big law, they’ll send you home in a car service when necessary. My 2016 income was just over $500k. I keep a spreadsheet and track where everything goes. After all spending including $170,000 income tax we had $160,000 left for investment portfolio. No mortgage payments helps. No ridiculous spending helps. Wife being stay at home mom helps (no child care, no cleaning lady, etc). This year should be making at least $600k. Plan on putting $200k into investments. Still take nice vacations ($20k annual budget), drive a 2016 Mercedes, spend lots on our kids (tennis lessons, summer camps) and a massive amount of taxes. Even with a pretty luxurious lifestyle we still manage to put a lot of money away. How much would they save if they didn’t have kids or had put off having kids until they could pay off some high interest rate student debt? I’m assuming a big chunk…my husband and I moved to the Midwest from NYC to cut down our living expenses and are currently focused on paying down our high interest student loans (we met in grad school). We are in our early 30s and have discussed having children but feel that would put undue financial pressure on us at this point. If this $500k couple didn’t have kids or waited a few more years they wouldn’t be “scraping by” – smaller home, less $ on food/vacations, no more daycare costs/college savings, smaller car etc. Everyone sits on a continuum between spending the same or more than they earn thru’ to saving most of their earnings. Where you sit on the line depends on various factors including: your stage of life, your free cashflow after mandatory expenses and your values. Assuming some level of free cash, how much you save basically depends on how much you value today (spending on stuff, experiences & supporting offspring etc) v tomorrow (FIRE). In practice it’s a balancing act for most people. By the very nature of the blog, most readers are likely to tend more towards the latter option. But earning $500k p.a. will come at a cost and it is understandable how such individuals might want to take rewards today rather than seek financial salvation at some point in the future (delayed gratification). Our society is basically geared up for “today” – just because you are good enough to earn large amounts of money does not necessarily mean you can resist the societal pressures to conform to some perceived consumerist “norm”; hence multi-millionaire bankrupt basketball players! The point you are getting to is that the marginal propensity to consume increases almost linearly with wages. This is fine – people get it. Just that you present it as some sort of a “There are people making 500k and they are just your average Joe” – the tone is a bit smug and frankly it’s not how most people live outside the Silicon Valley and New York etc. If the latest elections have shown something – it’s that people in the elite centers have no concept of how the middle lives. As an assistant varsity tennis coach, I don’t make much money. Only $1,500 a month gross in fact. I supplement my income through gig economy work and my writing online. I don’t begrudge anybody who works hard, pays tons of taxes, and tries to provide the best for their family. In fact, I appreciate their contribution and wish them happiness because working 60-80 hours a week is not generally fun. Buyer beware. I think the middle class is THE BEST class in the world. can’t they just get a divorce? Split house, children. Save on taxes. Retire early. We live in a NJ suburb and fit into this couple’s scenario. Generally agree with their expenses. While we may have less in student loans, we easily spend more than this couple in 7k summer camp, 25k nursery school for the twin 4 year olds. Add on another 5k per year in additional insurances between whole life, umbrella policies, and another 5k per year in house property management, (cost of pool maintenance and lawns) and another 5k per year in kids birthday parties that we attend or host. Our situation is a somewhat better than this couple, even after the cuts. I live and own a home NYC suburb with a wife and one child. The home was bought back in 2007 at 700K all cash but worth around 900K these days. We are in our early 40s and both of us work in the city. Our child is 6 and attends public kindergarten as we are in a very good school district. A grandparent also live with us to help out with childcare in addition to a part time nannie who also cooks. One have one medium size car that we only use on the weekends. We have a fairly large asset base which is mostly structured to generate only tax free income (munis) or income that is delayed for when we retire and our marginal tax rates are lower. That left us with 526K to plow into dollar cost average investments which are structured to pay interests and dividends only 10 years from now when we will be retired and be able to pay a lower marginal tax rate. Some will go to munis. Key difference between us and this couple aside from higher income is the concept of paying down debt quickly. Also making use of grandparents along with a nannie as critical to give quality childcare that you can trust. Also buy a house and car you need and not what you want. I think earning $703,000 more than this couple while being able to purchase a $700,000 all cash 10 years ago *might* be a couple huge reasons why you are better off. How old are you guys and what do you do? We are in our early 40s. I am a software development manager and my DW is an investment banker. Yes. Income has something to do with it. In many ways we ware what this couple should aspire to get to in 12-13 years or so. It seems to me they are not set up that way given the choices they made. The had children and bought a house too early relative to getting rid of their student debt. It seems to me they should rent and save up enough money to pay down the student debt. Then save up to pay a house at least 50% cash. Then have children. The way they went about this in terms of sequence it would be hard to build up a large asset base even if their income were to rise over time to a level similar to ours. They choose a high debt approach which could work relative to our approach if there is high inflation and their income still rises in inflation adjusted terms. The experience over last decade was one of low inflation and our zero debt approach is superior relative to the economic experience of last decade. Another way to think about a comparison between my budget and this household. If you strip out property taxes, mortgage payments, student and add in HSA on non-tax income tax spending for this household you get 136K. If you do the same for my budget it comes out to 135K which is identical. This household spending for this couple is a bit more efficient than ours since they have two children versus one for us. So the problem for them is not this 136K from where I sit since I spend around the same. But what kills them is the mortgage and student debt payments which is a combined 92K. Any asset they build up has to be to get rid of this debt. Congratulations on successful financial careers, by most accounts (except the uber uber rich) you made it. Summer camps in our area are very expensive. The one our kid goes to is toward the top although I know a couple of other ones which are even more expensive. The sports and swimming program at this camp is excellent. During the summer our kid does not take swimming classes so part of the 9K is offset by lower classes spending during the summer. Also this camp has its own bus system. So for other lower cost camps we would have to spend extra money to have our nanny drive our kid to this alternative camp and back. The cost doing that would cost and extra 1K right there so this camp is really 8K when compared to another camp that does not offer its own bus system. Curious though, do you find it easier and easier to deal with trolls as time goes on? I think you just get immune to it because it’s like drinking game. Drink whenever the haters say this, drink whenever they use this word, etc. It’s actually pretty fun. I’m not sure if I can call people upset with the article trolls. They’ve just decided to take a negative point of view instead of look beyond the bigger message from the post e.g. lifestyle inflation, etc. So perhaps dealing with criticism is easier as time goes on because I don’t view anybody who criticized the budget, these people, or me as trolls. I think it’s really FUN to have a debate about a real topic everybody goes through at a certain level or another. The feedback from the article is like a content GOLD MINE for a series of future articles exploring issues of work, taxation, judging others, writing, etc. I live in Brooklyn Heights, not far from where the couple in the article lives. We have one income of about $350k and two kids in a similar age group. Luckily, we are able to save about $80-90k per year. A couple of comments on the budget. First of all, the analysis should be after tax, because with all that debt, they will be able to get back a nice refund even if some of the deductions phase out. Childcare, if they go to a daycare, the figure is correct, but if they go to private schools it can also be double that. My children go to the public school. The $60k P&I assume that they bought their apartment (not a home, because at that price range there is none to be found in their neighborhood) with a minimum equity of 20%. It’s plausible because the millennials above us just bought their $1.2MM apartment with a $1.0MM mortgage and they are in a similar income bracket. Taxes are correct, but maintenance is not. If you live in a coop or condo, you pay at least $1,300-1,400 per month in maintenance and taxes are included in the maintenance. You only need one car, if you need one at all, but you likely have to pay $300-400 a month in parking. They also take a lot of taxis. I take the subway. Clothes, they can shop less, for sure. It’s $500 per month in the revised budget. Charity, they are very generous, we are not so much compared to them. Student Loans: We have zero. I am an immigrant and my wife went to a community college. You do not need to go to the top schools and run into massive debt to a have a fat W2, but many Americans still have this idea. Miscellaneous, I would keep it at $10,000 or more because there are other categories of expenses not included, e.g. utilities, cable, etc. and other small cash expenses hard to track. Interesting stuff right? It’s easy to judge others without being in their shoes. In this case, the tax burden is quite real. The 3 years of law school is absolute. The 60+ hours a week is painful. Maybe trying to live it up a little helps with sanity? Ha, the headline trolls are out in force on this one. Well good for you, tons of extra traffic. Living is Seattle, a semi expensive city compared to Manhattan or San Francisco, this makes complete sense. While it’s fairly easy for the FI/RE crowd to see opportunities for further trimming, I don’t think this is out of the norm for the average earners in this bracket at all. Great point on how the income tax bracket doesn’t account for cost of living, I hadn’t ever considered that before. That is such an advantage for remote workers living in a less expensive area while earning salaries priced for high COL areas. Huge savings/earnings % opportunity there. Keep up the great work Sam! To author – You are missing one big expense – health care costs? With the increase in health care premiums, deductibles and co-pays – it is a big hit to budgets. Premiums covered by work and health insurance. Now if both spouses don’t work, then things can get dire if they don’t have at least disaster health insurance. I’ve never left a comment before, but the news of the backlash that was emailed to us in the FS newsletter yesterday behooved me to offer my two cents, albeit at the risk of some personal backlash. I have been out of law school 6 years now, and the memory of living on a student’s budget is still fresh in my mind. When I entered big law in Chicago as a first year lawyer, I suddenly had too much money and no time to spend it. I am now married, no kids, still living in Chicago, and the two of us are in an income range similar to the couple in this post. 6 years ago, if someone had told me I would have a household income of over $500k in Chicago, I would have processed this amount similarly to how I currently process a $50 million income referred to by Kristen Lee above. In both cases, it would be an overwhelming amount and more than I could possibly need. 6 years have passed, and this amount is still more than we need but much less of the mythological status that it used to be. Over the last 6 years, I have found different ways to spend more than half the $500k, including things I always wanted to do but never could do as a student. For example, as a student, I could not travel to different states or countries for my friends’ weddings because it was too burdensome on my budget. When my mom was ill, I could not visit her as often as I wanted because international flight prices were too burdensome on my budget. These are just two examples out of many that I wanted but could not have. At the time, and even now, having these unfulfilled wants seemed absolutely normal and simply what life entails. Is it not the case that every life, even a billionaire’s is about compromises and living within constraints? To me, this was something everyone goes through. After 6 years, many of my previous wants are no longer unfulfilled, and my budget has of course ballooned. I stay under budget, but under my current frame of reference, it is not unfathomable that a person may have developed so many of these wants to exceed or just barely meet $500k. They may want to seek some financial advice to shave off where they can, but I no longer hold judgment regarding people whose costs have kept up with their rising income. Unwittingly, I probably have current unfulfilled wants that I am not even aware of compared to a version of myself making $50 million a year. If I make $50 million in an alternate reality, I would want my current self to be more understanding rather than offering judgment without experience. 3 kids names Piper! That got a laugh out loud from me, quite an accomplishment. “I strongly believe that over time, home equity is one of the major reasons for a widening wealth gap between home owners and renters.” I agree, but to take it one step further – I believe the mortgage is the biggest part of this benefit. If you paid cash, compared to inflation, your home value stays pretty steady. If you finance (like almost everyone does), you get the benefits of the home value going up while your fixed costs (paying down the mortgage) hold steady. People wrongly think it is that the home value went up so much or that they paid down their mortgage balance a little bit over 5-15 years. Nope. Inflation, leverage, fixed costs. Your theory is probably correct for the average person who thinks little about the workings of money. A home is essentially a forced savings vehicle albeit the ROR may or may not be worthwhile. For people who understand $ though, it should come down to a NPV calculation of alternative uses of $. $ going towards a mortgage payment may generate a better return in other vehicles. Only the individual can assess this for their situation and options. The point is that most people probably don’t even do the math or even think about this reality. I don’t understand. Wouldn’t your home value go up as well if you paid in cash? It would. It’s just the 5:1 leverage on a 20% downpayment that makes the returns really add to one’s net worth in a bull market. If a house goes up 10%, you’re up 50% on your 20% downpayment. Cuts deadly on the downside if you can’t hold on either. But the government is basically subsidizing homeowners and higher income owners with their mortgage interest deduction. Why fight the gov’t or the Fed? Imagine if you have 300K. You can either buy a 300K house or put down 100K and borrow the remaining 200K and invest the remaining 200K in, say Treasuries. You obviously pay interest on the 200K loan which are tax deductible but you also make tax free income from your 200K investment in treasuries. Which scenario is better is a function of the Treasury yield and the mortgage interest rate. Of course if you took that 300K and just bought a 900K house, borrowing the 600K difference AND real estate prices rise very rapidly then this scenario comes out the best. On the other hand if real estate prices tank you are the worst off. So the point is leverage allows you to take greater risk if you want such risk. Congrats on the press, even if it is negative. Your articles are insightful and entertaining. Maybe I’m delusional, but I think lots of the press coverage is positive. To be able to get people thinking about the point of running the rat race, making a budget, optimizing an existing budget, can really help a lot of people become happier. I’m going to predict in 1-3 years time random folks from all over will start commenting on this article or on the original article or sending me e-mails how their lives changed for the better. Oh, the delusion! But I’ve been around for 8 years now and this pattern of people commenting or writing in has not abated. If you’re unhappy, take steps to change course. So cool seeing that post break out and go viral, even if it did mutate into a goofy meme. Congrats Sam for making it onto the “mass market humor” stage! Behind the jokes though, there’s great analysis and suggestions for improving that couple’s situation. I bet a small but eager percentage of all that surprise internet traffic will make it through the noise and spend some time seriously reading this and other posts on the site, and will benefit from it. That article grabbed a lot of attention because of all the zeroes in the dollar amounts being quoted in the headline – but ironically, the advice still holds true even if you move the decimal point over to the left by 1. Congrats on the notoriety!! This article had stuck a chord with me when I came across it last year as we are in similar situation. Interestingly, last year salaries for associates at big law firms were likely raised, in part, because starting associates–which were being paid $160K–were having “a hard time making ends meet.” https://abovethelaw.com/2016/06/breaking-ny-to-180k-cravath-raises-associate-base-salaries/ Keep in mind, these are the top (college) of the top (law school) of the top (firm prestige/pay). And 80% will be gone within five years. Critics also ignore the fact the couple’s marginal tax rate is above 50%, which certainly ratchets up the difficulty of earning their way to riches. Could that be fair, sure, but its omission from the hit pieces is telling. And critics certainly don’t touch on the fairness of a married couple paying an extra $10k in taxes for the privilege of being married….. 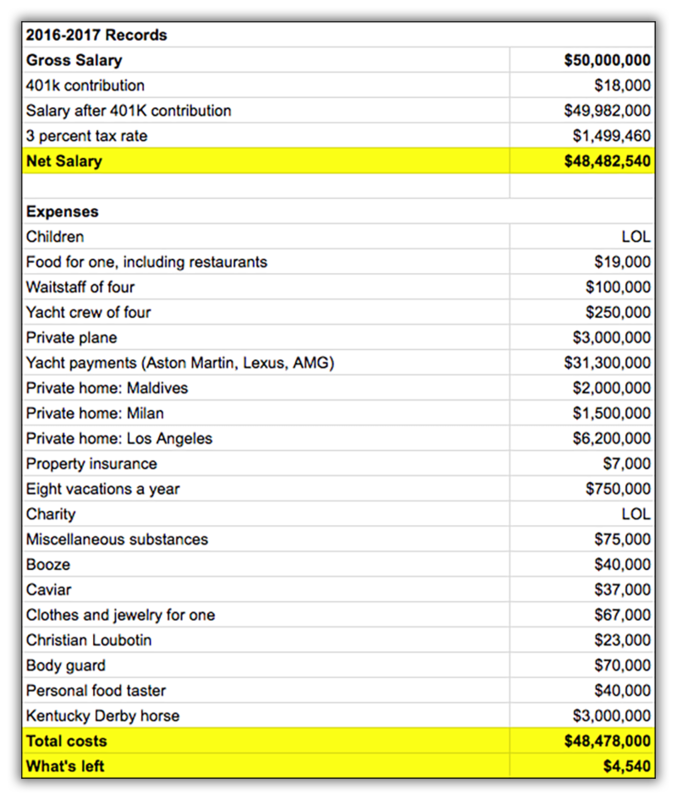 Interesting stats laid out about big law salaries! This DEFINITELY merits the Drudge siren. Of course we’re breaking out the Drudge siren for this! Taxes are painful. Oh how they are painful. Yet, the more you pay, the more people dislike you. Pretty neat stuff! I came upon Financial Samurai one day because I was literally googling “$500,000 and broke” and found that original posting. I thought finally someone understands 2 married professionals in California with kids and no savings! Actually we are good on retirement savings but very little free cash. When I read the posting on how much I should have saved based on age and income I was quite horrified to say the least! But like the example in the current posting I have really tried trimming the budget and trying to work a little extra when I can just to put directly into savings. I would also say that my wife and I drive basic cars and I hardly ever buy new clothes. We do try to stay somewhere nice for twice yearly vacations because we work so much it’s really the only time to relax the entire year. While some may poke fun at the original posting, it is my favorite, I can vouch for it’s validity and it has helped me change some things up to start socking away more. Ha this was awesome. I had read the original post before and then saw it pop up all over the internet and went, “wait isn’t this an older post?” I was sure someone stole it. Congrats on that post going viral! It’s so true how most people have a tendency to see what they want to see and jump to conclusions after only reading headlines without reading further. I think you do a great job at highlighting multiple points of view in your articles and using humor at the same time. Your articles are great reminders that it’s beneficial to actively manage one’s finances no matter how much or how little one makes. It takes a lot of hard work to make $500,000 in income (high stress, long hours, years of dedication, intelligence, specialized skills etc). And I can totally understand how lifestyle inflation can creep up for anyone. Ultimately everyone’s situation is different. And no matter how much or how little each of us makes from our active and passive income streams, we can all benefit from being more aware of our own finances and regularly looking for ways to manage costs more effectively while actively saving and investing more for the future. It is interesting to observe those who hate this couple for paying $170,000 a year in income taxes AND donating money to help eliminate child hunger. Not sure why, but fascinating all the same. If anybody thinks it’s easy to make $500,000 as a W2 earner, they have not done so themselves. I hope more folks realize things just don’t happen. Gotta put in the effort for a long period of time. Funny you should mention geo-arbitrage as we just kind of benefited from it. My wife just got hired by a Silicon Valley start up, as they’re moving some of their design and engineering operations to Vancouver, but keeping their executives in San Francisco. She received a 75% increase in salary by moving to this company, yet by San Francisco standards she is paid far, far less than anyone they could hire there (she probably costs half of what a similar person in SF would cost). Admittedly the company is benefiting largely on a weak CAD at the moment and when that rebounds the company will have to cough up a lot more to pay for their Canadian team, but that exchange risk is on the company, not my wife (she’s paid in CAD not USD). The CEO said a ton of San Fran start ups are looking at Vancouver lately because the talent pool here is quite good, the exchange rate helps significantly and the time zone is the same. Admittedly Vancouver isn’t a cheap place to live so it’s not like we’re benefiting from working in a cheap city, but she is being paid significantly more than she would from a local employer. Glad she got a big raise! I’m surprised by Vancouver since it is even more expensive than SF (more like NYC), with no big industry paying big bucks. I’m scared of Vancouver real estate. All that to say – congrats man! Traffic is traffic! Cool! Did she really think people hate everything? I thought it there was actually a lot of good feedback about discussion lifestyle inflation, heavy taxation, and ways to make ends meet with less and more. The traffic bump was nice, although it’s funny, b/c it would have been more exhilarating when this site was smaller. Hedonism! Glad the page has suddenly got so much attention. It’s definitely one that can fire the imagination! I think the whole lesson from that page is the importance of paying yourself first – a point straight from “The Richest Man in Babylon.” If this couple paid themselves $5k a month immediately then they would work out how to live off what’s left. $200/mo for ridesharing is not enough IMO. I live in the city and don’t own a car. I use a combination of bike, bikeshare, public transit, and rideshares. My budget is about $200/mo for transportation for one person. a) To put all it to pay down student debt until it is all paid off. b) 41K goes to pay down student debt and increase college savings from 12K to 20K since they can use 529 to save on NY state taxes. Since NY state tax marginal rate is 6.85% then can save $1370 off by doing all 20K in college savings in 529. They can do 10K per child and since they have two 20K is recommended. b) is a great point about using the NY 529 to save and invest. At least they’ve started to save $1,000 on college right? Baby steps! FS, the reaction to your (very fun and interesting) post is a perfect example of ‘manufactured outrage’. Your headline provoked, people clicked, the ones who actually read it understand the points you make, and meanwhile you got paid. Nicely done! fwiw, ‘Pulitzer Prize winning journalist’ Michael Hiltzik has had his own scandals, being suspended and almost fired for creating a sock-puppet and praising his articles while criticizing (anonymously, natch) those who criticized him. Interesting commentary about Michael! Any source you can highlight regarding such things? I really think the responses from folks are a reflection of their current state. Maybe there are some things going on with Michael behind the scenes we do not understand. Life is complicated. Bad things happen all the time. If folks who are unhappy can use Financial Samurai as a punching bag to relieve some stress in a well thought out manner, I’m all for it! Hiltzik is a very troubled person, indeed! As a lifelong (former) LAT writer, I’ve seen him bounce around from beat-to-beat, never quite ‘getting it.’ He’s a purported business writer, but his articles are SJW class-warrior stuff; never any actionable takeaways. :-) That day is coming, might already be here! Biggest difference today from 2006, Bloggers have more cred! Property taxes in Brooklyn are disproportionately low for 2 main reasons. One is there is a cap on how much the taxes can go up, 20 percent increase over 5 years tax class 1, or 30 percent over 5 years for tax class 2. Secondly, which ties into the first reason, is Brooklyn was very undesirable 10, 20 years ago. Property values have grown 10x in the last 20 years. If you compare Brooklyn to queens, which has historically had a working class demographic and property values don’t fluctuate as much, the taxes are much higher. Good stuff. Queens. Such good value I can’t believe it! Not sure why there’s a stigma living in Queens. F train right? Easy access to Flushing Meadows/US Open ever year! I’m a buyer. Prices in Queens have gone up a lot as well its hard to find a decent home under 1 mil in bayside, astoria, or forest hills. Which is why I decided to buy in long island while the property taxes are higher you get more for what you pay for and you don’t pay city income tax. Plus some of the best school districts in the country so you “save” money on private school. Control what you can control. Yup. I’m not quite making $500,000 but pretty darned close. We live in a low cost of living area in a house that I bought with cash with one year’s after-tax salary. Property taxes are low, my wife stayed home with our boys, and we’re able to save far more than we spend annually. This is a couple that is enjoying a fairly high degree of luxury in life *and still has money left over* when all is said and done. Their 401k’s are maxed out, they are current on all of their bills, live in a $1.5 million home, take multiple prizeworthy vacations per year, their children are getting “the best” of everything, and they give a sizable amount of money to charity–good for them…but they are concerned that even though they enjoy all of those things with money to spare, they don’t have even more. It’s the expectation of more that sticks out. *That* is the mentality that grates against the majority of Americans–the “I have so much, but why don’t I have more than I do at the end of the day?” If it were simply a post about how easy it is to overspend, then it would be different. But there is some degree of defensiveness of the couple that doesn’t quite make sense. They’ve made lifestyle choices that only leave them with a certain amount at the end of the year. If they want to have more at the end of the year, they will have to make less expensive choices. Or they will have to earn more. Regardless, their current financial status is not at all bad. And clearly, given that the average household income in the US is $52K, and this couple is bringing in 10X that, it’s not going to be possible for the great majority of people to sympathize with what is, in actuality, a non-existent problem. I’d be a lot more interested in a public-policy oriented conversation about how we can combat ridiculous costs of living so that things are a little easier on everyone. I think even if I say I understand that the words “Scraping By” irks people, you wouldn’t believe that I understand it irks people. When you have $7,300 left, equal to only 1.5 weeks of expenses after each paycheck, that’s scraping by IMO. There’s no point trying to convince others of anything. Instead, control what you can control to get better as person. The solution to lowering cost is geo-arbitrage. Find a way to make an equal amount of money in a lower cost of living area. Enter the internet and flexible companies. I’m not surprised by the response. At this income, even in extremely high cost areas, it should be pretty easy to live well and still save a lot. There is a lot of fat that can be cut in this budget. At the same time, without a conscious effort towards spending wisely, it’s certainly easy for each spending category to grow when your income is so high, until it feels like all these expenses are just “regular” ones and you wonder why you aren’t saving much. Since you like specific example to understand the source, for reference, my household income is also quite high (more recently) although a bit below this example. We live in a middle-high cost of living area on the East coast and manage to save 73% of our take-home pay. And 25% of our spending is daycare alone. We could certainly spend 4x more like this example but it’s not even close to necessary. We live extremely well in a big house (paid for), nice cars, many lessons for the kids, one good vacation a year, etc. I can’t see that we’re making any real sacrifices. Anyway… I’m 100% debt-free and early-retired in my mid-40s and I’ll just say it: We feel financially tight sometimes on a $100k budget. Crazy as it sounds, it’s true. I see people like Mr Money Mustache living happily on less than half that, and I think that’s awesome. But for us, we’re young – and “retired” – so we want to travel, and dine-out on occasion, and we have a family gym membership, and a daughter in college, etc. $100k goes fast. I can just imagine the eye-rolling from many people who’d think I’m nuts, but it is what it is. Brad, glad you said that. I’ve been playing with numbers and did the “FTI” estimation (if (age*net worth)/(annual expenses) > 1000, you’ve got enough to retire ) and coming out with up to $140K as a potential annual budget in retirement. Then I’ve been worrying back and forth with whether that’d be enough, or I should get another couple years’ worth of savings etc., and in some ways thinking I’m crazy – of COURSE 140 should be enough. With 4 kids still in middle and high school, maybe I’m not so crazy for worrying 140 may not be quite enough just yet. I think “the number” is what keeps a lot of pre early retirement folks up at night. 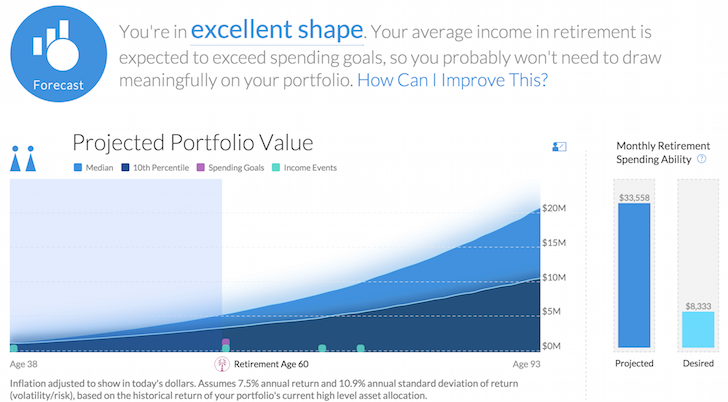 I have an optimized plan where I should easily have “enough” if I retire at 50. Thanks to police pension formulas, my pension rate doubles if I stick it out to 57. Yet I can’t get over the thought that every year near the fall/winter of your life is special, is an extra 40k a year in the pension worth it? Good point; I can’t imagine how much harder it is to figure as a cop. Working as a usual corporate cog in the wheel, I have no real concern about “death from work”. Yet for you, every additional year on the force is another year in danger (at least, certainly more personal danger that a corporate cog like me faces). After five years of early retirement, and speaking to at least 100 people who also retired early, you need much less than you think in retirement to be happy. It all depends on what you want out of life. If you value private school and brand new cars over time, yes, you are going to be needing a lot of income. Our early retirement budget is $60k “all in” and it has a lot of padding in it. We aren’t particularly frugal and that budget includes a mortgage. We live a very typical suburban lifestyle (minus brand new luxury cars) in a upper middle class neighborhood. I wrote about our budget in my early retirement checklist on my blog. I can’t imagine that spending more would make us any happier. A second thought is due to the “progressive” nature of the tax code, along with a tax code that favors marriage and children, it’s pretty easy for us to net a lot of our budget. A higher income earner is going to need to gross considerably more to “net” the same amount if their spending needs are higher. I totally agree with you and with other opinions on the comment area: the better you save, the freer you will be. My wife and I are fortunate enough to be in the same income club as your hypothetical couple. Like them we are also just highly paid employees – all of our income is on a W-2, which means we have limited options to shield income from taxes. We are, however, more fortunate to live in the midwest, so our COL is probably much lower than your example couple. Long story short, we have a child in college and one in high school. The past several years we have saved an average of 30% of our pre-tax income and 45% of our after tax income. Housing costs are the killer in high COL areas. Our savings rate has been so high because we only spend 10% of our take-home income on housing related expenses and buy used cars that we drive for 10 years. Basically, “upper middle class” income in major cities buys you 3 things: an expensive house, private school for your kids and too many goodies that have no lasting value (“entry level” luxury cars and clothes, the obligatory lower-end mechanical watch and “workcations” at expense destinations during peak-pricing). If you want to save, you need to skip one or more of these. All in all, I’m looking forward to stepping back in three years and living a life closer to yours, or Physicianonfire’s or Rootofgood’s. Sam, great article as always. I fully support the fact that a couple making 500k can, and more often do, spend all that they make. Ultimately, after giving this subject considerable thought over the years it comes down to one simple idea for me. Most of us as young adults had to save money to buy what we wanted. We worked and saved and were able to give our potential purchases a lot of thought. When one becomes very successful we transition to a “why not” mentality. “I make a lot of money, why wouldn’t I buy that?” More often than not it’s death by a thousand cuts. It’s all these (what seem like) small purchases that add up throughout the month. It’s so easy to “add to cart” and have a package waiting for you two days later. Companies spend so much money on advertisements because it works. Consumerism is the most powerful drug in America. It’s what makes our country the greatest, but it’s also responsible for why a lot of people here aren’t happy no matter how much money they make. I live in San Antonio, Texas – a place you wouldn’t associate with a high cost of living. However, it is extraordinarily easy to allow oneself to experience “lifestyle creep” no matter the city they live and work. I would be happy to provide you with my budget when I did spend most of what I made and how I have changed since seeing the light. I give you a lot of credit for helping me in this regard. Is the couple really going to change their budget? It’s tough to cut back. The new budget looks a lot better, but they’re still not saving enough. We make a lot less, but we save more than that. Those folks really need to get some investment rolling. They are spending a ton of money every year. Sam, this has nothing to do with this post, but it’s urgent: I remember a while back you said what if the bull market was in fact a massive Ponzi scheme…????? OMG I just read something on Twitter that brought your comment back to me. I know you have avoided politics on your blog in typical play-all-sides rich-person fashion (which is good, tho my heart was broken by our failure to elect our first woman president). BUT holy crap what if you were right about the Ponzi scheme? To quote Adam Khan, @Khannoisseur on Twitter, “Trump-Russia isn’t a single thread–pulling at it will collapse the entire ugly sweater: Think Watergate x Enron x Subprime crisis”. He’s from San Francisco BTW, and has done amazing work sleuthing the connections/corrruption in the current presidential administration. He also said “Madoff brought down Wall Street; Trump will take down Wall Street and K Street–few there want this”. Thoughts???? This is why I left SF. The world is coming to an end. But hopefully we have a good life before it does. If you think about anything that involves entrusting an organization with money, it’s all about trust. Even banks have less than 10% of their actual deposits in cash. Any couple maximizing two 401k accounts and spending $23K on food and $9.5K on clothes is not scraping by. But as you said, most people don’t read entire articles and rush to judgement. I agree, they definitely are not scraping by. The majority of their expenses are, in my opinion, optional. Which means, if desired, they can go away at their choosing. Sam is pretty good about sensationalizing his posts and backing them up with “rational” math. But, what the couple’s budget points out is that people spend their money on what they value and it’s easy to fill your money with related expenses whether you make $100,000 or $500,00. This couple is already maxing out their 401k to the tune of $36k per year so, at least they’re saving. A simple annual savings rate of 6.5%, compounded monthly, for 20 years will yield at least $1.6 million (This is simple savings so doesn’t include dividend payments). So, again, they are doing pretty good no matter how we cut it. As for optimizing the budget, technically there is nothing wrong. It assumes they want to cut out the things they are spending money on. To each his or her own, right? That being said, if it were my budget, based on things that I valued, it’ll be easy to optimize. At the end of the day, unless someone is aiming for a retirement where they no longer want to work, what’s the point of saving 50-70% of their income if they enjoy what you do and are enjoying the things on which they are spending their money? Perhaps they should just enjoy the fruits of their labor and keep at what they are doing…as long as they are not in a situation where a job loss would disrupt their entire life. This couple is doing awesome, relatively speaking! When one of these stories first popped up in my google feed I thought someone had ripped you off but they were actually just attempting to make fun of you. 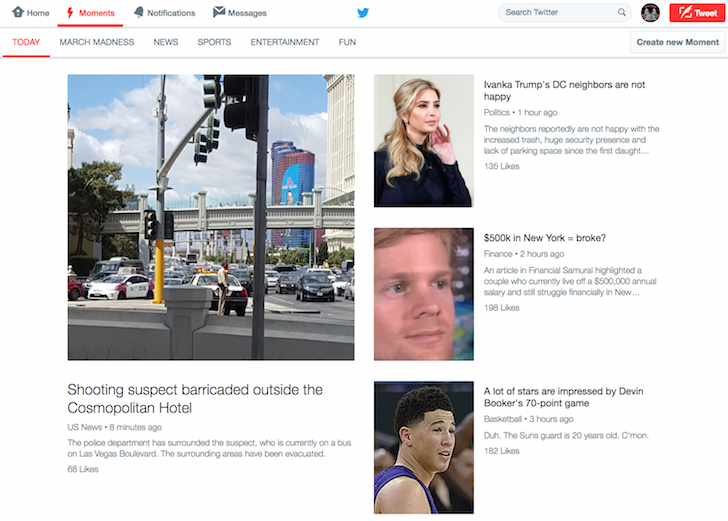 I think it is cool that you have made it to the point where where major news outlets feel like writing about something you wrote. You are always doing something right when you got haters. I really like the original article as lifestyle creep is a very real thing whether you make $40,000 a year or a million it is difficult to avoid. I look at how much I spent on rent, food, clothes and gas in college and I now spend that much in two months. Yep, I certainly remember living off of about $7,000 per year when I moved off-campus my last two years of college, which is actually well below the federal poverty level for an individual. And you know what, I was perfectly fine. But I was also willing to have 3 roommmates, rarely ate out, didn’t own a car, didn’t go the movies or travel, rarely went shopping, etc. As soon as I graduated, I found a way to fill up the income I was earning. From a salary of $30K to $55K to $70K and now even more, I have seen how easy it is to just spend according to what you have rather than according to what you want to keep. It’s pretty fun to write a post about other people writing a post about another post. Gotta bring the BASS to the biggest echo chamber in the world! Let’s not forget that where people choose to live is an actual choice. You can say they’re chasing jobs, etc…but that becomes self defeating when said jobs are offset by the location. I know many people who live in these expensive cities on both coasts, and they’re always trying to convince us to move there. There’s no doubt they’re wonderful cities to live in, but they carry a high premium. This couple made a choice they believe is right for them, and I’m sure they realize it’s at the expense of other options available to them. At the end of the day, their finances is a direct reflection of their values. I love many of those cities, and have lived in a few. I just choose to delay gratification (living there) until later in my life, when I don’t have to compromise as much. I think the hatred exists because many people see money as the solution to all their problems. They think, “if I only made $100k, $150k, $250k….” then life would be great. Plus, those that make the negative comments are the one making the average or below average salaries. Those out hustling to make more money are to busy to get all bent out of shape on twitter. I’ve always said that regardless of somebodies income most people feel someone making two to three times what they make are well off and someone making more than three times what they make are rolling in it. For. One the couple can probably optimize there tax bill further. Pick up a dependent care fsa for day care if the kids are under 13. Put money in an HSA as part of the savings. To that add travel hacking the vacations. I’d also downgrade the cars or hold them longer. Not knowing more about their situation it’s hard to give more advice. They can definitely decrease costs, but I don’t begrudge their choices. It’s their money and their life. I thought the post was insightful and as a high income earner (physician) I understand how people can fall into the trap. Heck I feel bad for buying a $1.2 home and it is in your 3x-5x income recommendation. Still it feels wasteful but that is the price for living in Cali. Not to mention taxes (way worse then my home state of Tennessee where there are 0% income and dividend taxes). We all like to see our side of the argument. That is why people’s Facebook is full of like minded people and not those with the opposite view. It is like a large talk radio station where everyone can call in. Full of noise with little actual knowledge. Good call on choosing a much cheaper state to live. I’m still in California (where the jobs were), but I’m hoping to relocate to Dallas soon to take advantage of the same lack of state income taxes, and much cheaper cost of living. I agree that it’s easy to fall into the trap as a high-income earner, but it’s not inevitable–even in expensive Los Angeles. I guarantee 99% of my co-workers (big law firm) blow through their entire salary each year. I just choose not to… After 7ish more years, I’ll be in a position to stop working forever (and spend considerably more than I do currently if I want), and everyone else will still be wearing the golden handcuffs. Blowing through that much money, while knowing that it’s only sustainable through constant 60-hour work weeks just makes no sense to me. I was looking at this budget and two points hit me: the 32k student loan debt and the car payment. Well done for making almost 49k adjustment, but I’d personally reallocate all these savings against those two debts. Once they are paid off with an increased pace, there will be even more money available which can then be invested later on to generate some additional income stream. After this, the couple can share their story in the media so they will be hated even more :) People are jealous and these voices are always louder (especially on the internet). But what if the student loan debt interest rate was only 2.25%? I say they should implement FS-DAIR and invest 78% of their free cash flow and with the rest to debt. If the student loan interest was that low, of course it would change things. I kinda had the idea that interest rate on student loans in the US are higher. I read your FS-DAIR article; interesting stuff. It will be applicable for me very soon as I’m just about to increase my mortgage in order to buy an investment property. Will need to come up with a debt repayment plan, so your article is quite useful. Sorry, I’m not going to pinch your nuts. (Hey, you’re the one who said humor’s effective!). I had lunch with my insurance guy the other day, and he told me about many CEO clients of his who are making $1M+, but still broke. I told him about your story. Whether your making Millions, or mere Thousands, the basics are the basics. Spend less than you earn. The wider the gap, the sooner the Freedom. Good suggestions for our broke $500k friends who spend too much. Quit judging, and start saving. Be Free. It’s amazing when the collective lack of an attention span turns its eyes on something you’re familiar with, as in this case. The humour is particularly interesting, because it gives perspective to those similar cases where you’re not familiar with the context at all, yet find yourself laughing, nodding and agreeing.